"...Looking back at my school experiences, it is difficult to see what purpose the cult of right answers, which extended far beyond the world of mathematics, served, other than as an odd kind of social sorting mechanism. The successful competitors (including me) sat on the edges of our seats, ready to perform our next trick and obtain a herring from our trainers, the less successful got hungrier in the back until many forgot what food was." This is a quotation from a book by David Albert, whom I had never heard of, but whose homeschooling books I will definitely be searching for in the library iA! 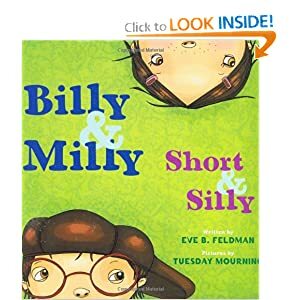 Billy & Milly: Short & Silly is a title which gives a perfect summary of the book itself. It's about a boy called Billy and a girl called Milly, and their adventures are indeed extremely short and extremely silly. 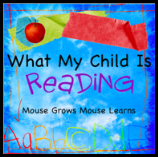 However, they have the great advantage of being easily readable by a child with only the most basic phonics and word-building skills, which Basbusa finds extremely satisfying. One sample "story" goes like this: "Room. Broom." (accompanying a full-page picture of a fancy bedroom with a broomstick in it.) "Boom! Zooooooooooooom!" (as Milly hops onto the boomstick, flies up through the ceiling (hence the "boom"), and zooooooms away. All of the stories consist of only three or four rhyming words, like this one, and the plots are correspondingly - well, short and silly. But Basbusa's a fan, and has chosen this one from the library three times now. 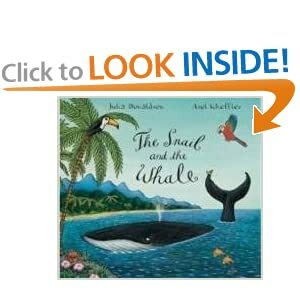 The Snail and the Whale is a book I saw on is Learning with Mouse's best books of 2011 list, and since we've really enjoyed several other books by Julia Donaldson (The Gruffalo, The Gruffalo's Child, Room on the Broom), I knew we'd like this one too. And sure enough, it was a very fun read. It's all in rhyme, which is Basbusa's favorite format, with plenty of humor, and attractive, busy illustrations. The story describes a snail who longs to see the world, and hitches a ride on the tale of a whale in order to explore with him. The snail is awed by the size and splendor of the sights he sees, and is feeling very small and insignificant, when suddenly he finds that he, only he, can come to the rescue of his gigantic friend. 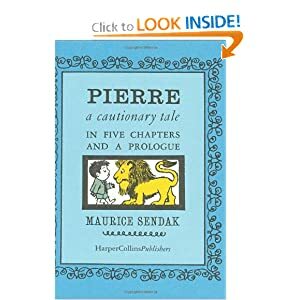 I think I must have read Pierre: A Cautionary Tale sometime myself, because it seems very familiar. So excuse me if this is such a classic that it's old news to everyone else! Although the title describes the books as being "in five chapters and a prologue," each chapter is really only a page long. It's a poem about Pierre, whose only response to his doting parents, and even to a hungry lion, is a jaded "I don't care!" And so the lion ate Pierre. But don't worry, his parents get him out again! Basbusa liked the story, liked the rhyme, liked the small size of the book (as always!) and liked how fast the "chapters" race by, giving her frequent opportunities to announce "Chapter FOUR!" or "Chapter FIVE!" 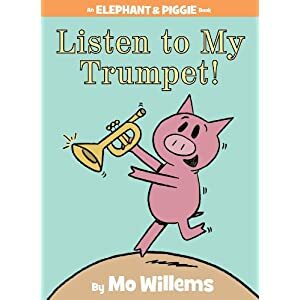 Linking up with What My Child is Reading and Read-Aloud Thursday. A Few Blocks has been one of the biggest hits we've had in our house lately. The story describes a sister and brother's short walk to school - but since Ferdie, the little brother, is in the middle of three different games at home and doesn't want to go at all, his sister, Viola, has to coax him there. She turns their walk into a game of superheros, and then of pirates, and then of knights and princesses... before running out of inspiration herself, when Ferdie steps up to return the favor. 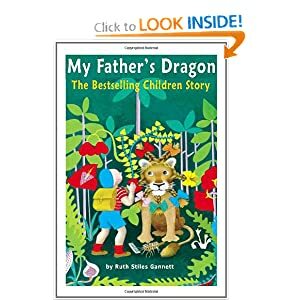 Basbusa adores this story because pretend-games are her favorite activity, and she loves watching the two children invent new surroundings instead of the ones they find themselves in. The illustrations are beautiful, too, with the real world in black and grey, but the children's imagined world in pretty pastels. For me, the caring relationship shown between the two siblings was another reason to love this book. 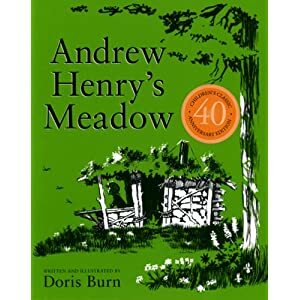 I found Andrew Henry's Meadow on somebody's list of vintage books that their child enjoyed, and I'll be checking out more of her suggestions as soon as I can remember where the list was! Andrew Henry, the middle child of his family, is an enthusiastic and talented inventor, but somehow his family don't seem to appreciate the giant contraptions he keeps building in the middle of the kitchen or hooking up to their sewing machines. So he decides to run away to a hidden meadow, where he builds himself just the kind of house he has always wanted to live in. He is soon joined by other children who have likewise have found that their parents disapprove of their somewhat eccentric interests. Andrew Henry builds each one a house corresponding to their passions and needs, and soon there's a whole little village of children in his meadow. But of course their families are terribly worried, and eventually find them and bring them back home, after a joyous reunion. Basbusa liked the story overall, and especially liked looking at all the different houses Andrew Henry built for his friends, and choosing which one she'd like to live in herself. 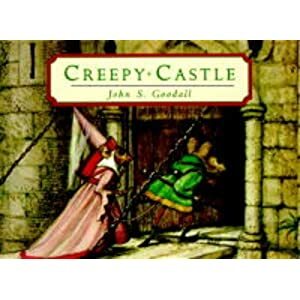 For Basbusa, I think the biggest attraction of Creepy Castle (and others by the same author, such as Naughty Nancy Goes to School and Adventures of Paddy Pork) was that the books themselves are so small. 5" by 8", maybe? She loves miniature books, no matter what the content! (Come to think of it, when she was a toddler, one of her favorite books was an empty miniature photo album, which she "read" over and over and over again, pointing out completely invisible goats and flowers...) But leaving aside the size of the book, these stories are exciting and accessible wordless adventures that Basbusa can easily figure out on her own from the illustrations. My only criticism is that the mice look a little too realistically ratty for my taste! 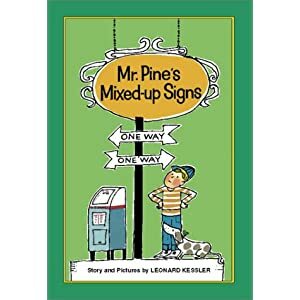 I think Mr. Pine's Mixed-Up Signs was another suggestion from that vintage list? The plot isn't exactly thrilling - a sign-painter loses his glasses, gets all the signs in the town mixed up, and then sorts them out again - but Basbusa liked it a lot, I think because it was so easy for her to "read." There were plenty of signs with words she knows, like "stop" and "go" and so forth, and the rest of the text was simple enough that she could improvise even if she didn't know the real words. I wouldn't actually have recommended this if it were just up to me, since I didn't find it particularly enthralling, but it definitely made Basbusa's list of favorites. As time goes on, I'm feeling less worried about plunging into homeschooling in the fall. (I keep reminding myself that it will really only be a minor splash at most, since Basbusa will only be four, but in my head it still feels like it will be a plunge of epic proportions!) The two elements I was most concerned about were my own ability to establish some kind of routine, and finding opportunities for regular social interactions for Basbusa, and those two things seem to be sorting themselves out a bit. I've managed to find three other moms with daughters near Basbusa's age, who are all interested in setting up a weekly playgroup. (One of them even has a daughter just one day younger than Kunafa!) We'll be meeting next week to let the girls play and to chat about what kind of structure each of us has in mind, but I'm crossing my fingers that it will work out well. Plus, there's now a bi-weekly playgroup at the masjid that seems like it will have staying power insha'Allah, and we've gotten to know two other homeschooling families nearby with young children. I was worried about routines because I've never, in my entire life, managed to stick with them, no matter how loosely-structured they might be. I know that it's not essential to have a routine or schedule, but I think it might be helpful for the girls to know where we are in the day and in the week. For myself, too, I can see myself becoming easily stressed about whether I'm doing "enough" of a myriad different things with the girls, if our lives were so unscheduled that it was very hard to keep track of what we had been doing. So, I've made a tentative schedule for what our lives might look like in the fall (which I'll post in the future), and I'm trying even now to do little bits of it. My girls have never had afternoon naps or quiet times or anything, but I've now started memorizing Quran myself after we're home from any morning activities and the girls have had lunch. They have to find some way to entertain themselves while I sit nearby, working on Surat Al Noor. It's actually working out very well, al7amdulillah!! It turns out that they're perfectly capable of finding things to do when they see that I'm really engaged in doing my own thing, and since the activity I'm engaged in is a truly worthwhile one, I don't feel like I'm a bad mom while I'm doing it :) Plus, I've noticed that the kids who are most enthusiastic about learning Quran are the ones who see their parents doing the same, so I'm hoping the example will have been useful to Basbusa by the time I start more formal Quran lessons with her in the fall insha'Allah. It hadn't even crossed my mind to think about starting chapter books with Basbusa. She's only three and a half, and I'm pretty sure my mum didn't start reading chapter books with me until I was much, much older than that. 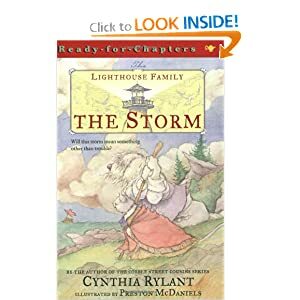 But I noticed that all my favorite blogs for picture-book recommendations were also talking about the chapter books they were reading with their preschoolers, so I thought I'd give it a try. It's been fantastic! We read a chapter a night by the light of her night-light, while she's tucked up in bed, which we could never do with picture books because Basbusa would insist on sitting up and leaving the lights on so that she could see properly. Plus, when she's stalling during the last stages of the going-to-bed process, the phrase "but don't you want to find out what happens next to ...?" has proven nearly magical. Or, as a last resort, I wander nonchalantly past her as I head for the bedroom, reading aloud as I go, "Chapter Nine: The Thunderstorm...." She comes dashing along after me, not wanting to miss a word of her story! During the day, Basbusa takes these books and "reads" them aloud for literally an hour at a stretch, making up endless, convoluted stories as she flips the pages. 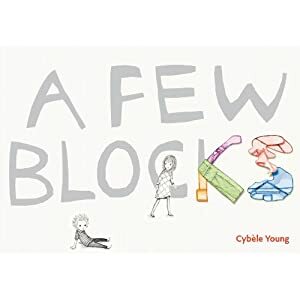 She occasionally uses the illustrations as inspiration for plot-twists or sub-plots, but really she's off in a world of her own. (An excerpt I overheard today went something like, "'What are you doing with all that blood? ", she exclaimed. 'You are making a big mess." In a fit of rage, they galloped off on their horses." (?!?!?!)). Basbusa has been spending lots of time making up stories lately anyway, but she seems to find flipping through the chapter books a big spur to her imagination. So here's what we've read so far. All these books have very short chapters with plenty of illustrations, and not-too-complicated plots, so they're just about right for Basbusa's current before-bedtime concentration-level. The biggest hit so far is Milly Molly Mandy Stories. Milly Molly Mandy lives in an English village in about 1920. Each chapter of the book narrates not so much an adventure in her life - because nothing very dramatic happens to her - but rather an incident in her ordinary comings and goings. 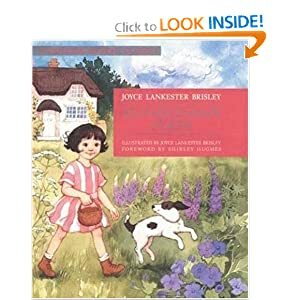 The charm of the stories lies in the way the author describes these happenings, so that a trip to the village shop to run errands for her family becomes just as momentous an event for the reader as it is to Milly Molly Mandy's own six-year-old eyes. Basbusa was entranced, and we'll definitely be looking for the sequel. 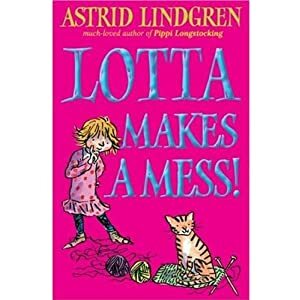 Lotta Makes a Mess, like Milly Molly Mandy, is a book I read during my own childhood. Astrid Lindgren is best known for the Pippi Longstocking stories, but we tried those, and they're definitely a bit beyond Basbusa for the moment. Lotta, on the other hand, was just right. In the middle of a tantrum, Lotta, the youngest of three children in her family, takes a scissors to the sweater her grandmother has knitted for her. Horrified by what she has done, she decides to leave home, and moves into their next-door-neighbor's garden shed. Basbusa could totally sympathize with Lotta's going further than she had meant to, mid-tantrum, and was round-eyed at the idea of her actually leaving home and living by herself - until night-time came, and the garden shed got very quiet and very dark.... It looks like the same book is also sold as Lotta on Troublemaker Street, in case your library has title and not the other. 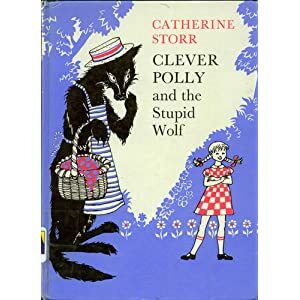 I knew we just had to get Clever Polly and the Stupid Wolf when I saw it recommended online (where?!? I was sure I'd bookmarked it!). Basbusa loves playing run-away-from-the-big-bad-wolf so much that her preschool teachers had to ban the game in her classroom, so I thought this book would be just her thing :) And sure enough, she did enjoy it. Like Milly-Molly-Mandy, each chapter is a stand-alone story, which is ideal for pre-bedtime reading. A few of the stories were a little bit too complicated for Basbusa, and I know some of the jokes went over her head, but most of them were just the right brand of silliness.